Julia Chiang was born in Atlantic City, New Jersey but has lived and worked in New York for over 10 years. She recently returned from an artist residency in the Colorado mountains and was a nominee for The Rema Hort Mann Foundation art grant. She has exhibited her work at places such as: Deitch Projects, The New Museum, OHWOW in Miami, Michael Steinberg Fine Art, Tina Kim Gallery, Printed Matter and in the Kantor/Feuer Window. Julia is an active supporter and contributor to the Bicycle Film Festival, The Creative Center, Visual AIDS, Stoked Mentoring and exalt youth. She will also be part of the new Standard Shop. Hugs + Kisses, 2009. Ring Pop candy and nails. 144″ long, 93″ high, 2″ deep. I believe her work to be very delicate and feminine mainly because of her choice in wording in the installations. Julia Chiang uses words like “hugs + kisses” (repeatedly), “I love you”, “sincerely yours”, “love always”, and “one of a kind”. Ring pops are assembled on the wall and spell these words in all caps. The candy above the actual ring melts over time and slowly drips down the walls since they are placed under gallery lights. The melted sugar stains the surface giving the audience the chance to actually see the artwork transform. While in an interview Julia Chiang describes what drew her attention towards the materials used in her works. "I am drawn to things that change and deteriorate over time. I've always loved watching things evolve, and I think making work that is left to its own nature has that beautiful element of chance and unknowing. Ephemeral materials reveal a passage of time and instability, and the materials I have used leave a mark so even as they fade or disappear, they are permanently there somehow as well." More of Julia Chiang’s projects were showcased last year, which includes an installation at The Standard NY named “All For You” where she launched an exclusive edition of 50 glazed porcelain apples. Furthermore, Julia Chiang has also created a site-specific installation for the new store at The Standard NY which opened in Feb 2010. Using the title of the edition, “All For You” is spelled out with Ring Pop candy along the wall of the shop. We see again that the candy is left over time, constantly changing, slowly disappearing, while leaving the trace behind. Chiang chose the apple as a symbol of desire and an icon of New York City. 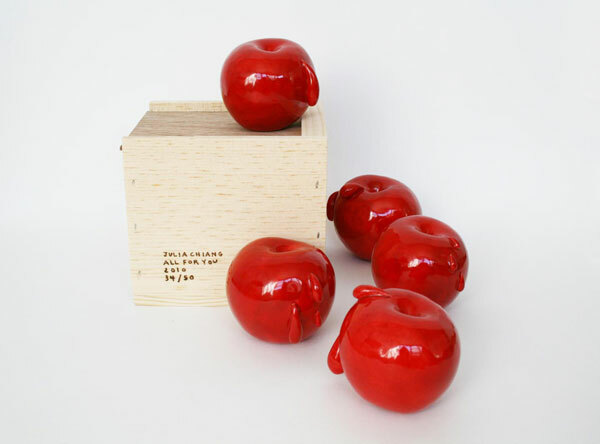 Each unique apple is handmade in porcelain and glazed a glossy red, each piece includes a wooden box that has been burned with the details of the edition and is signed and numbered. 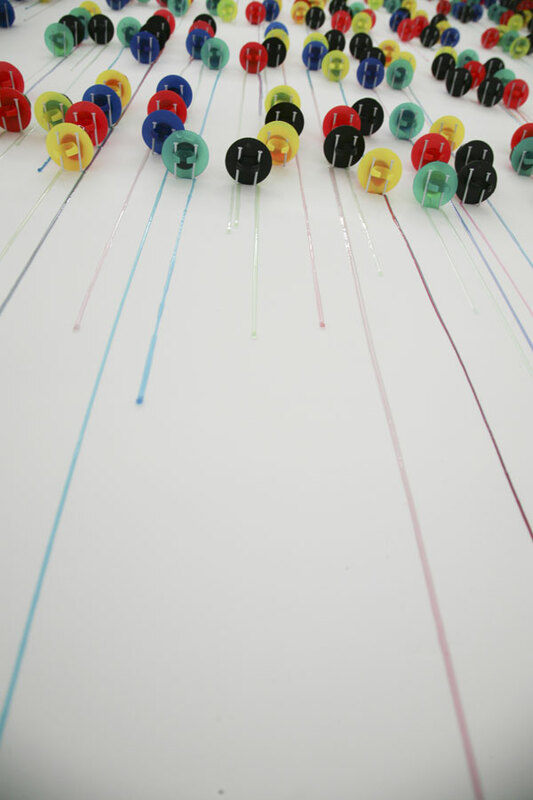 Keep It Together (detail), 2011, unglazed ceramic, dimensions variable. Julia Chiang's most recent works was hosted by the Half Gallery in New York and was titled “Security Is Mostly A Superstition”, it was the first New York solo exhibition of work by artist Julia Chiang. 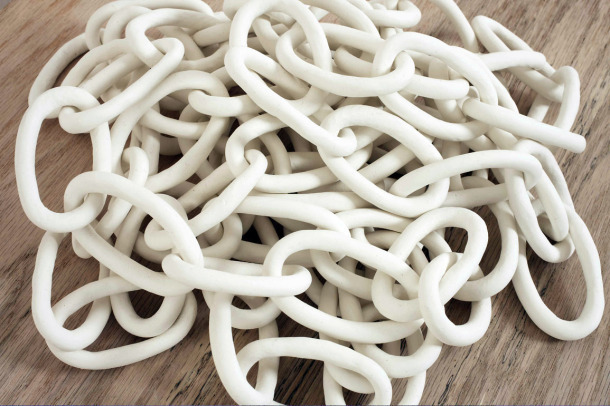 Julia Chiang presented a room-size installation of white chains, ranging in length from five- to thirty-feet, made from handcrafted ceramic links. 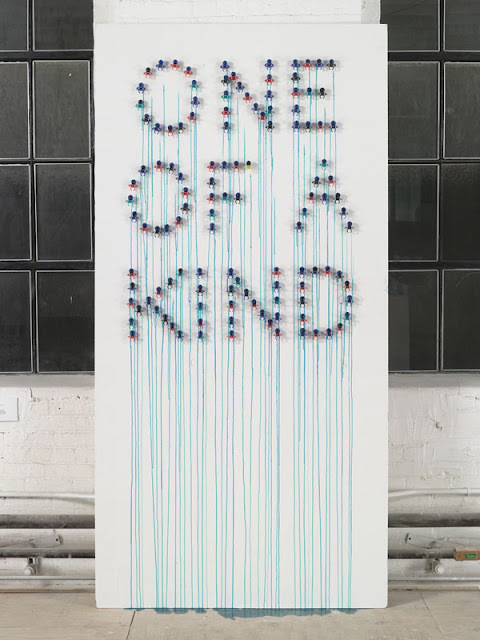 The work is beautifully displayed and may seem like a very simple piece but in my opinion it keeps you thinking especially because each link is unique. 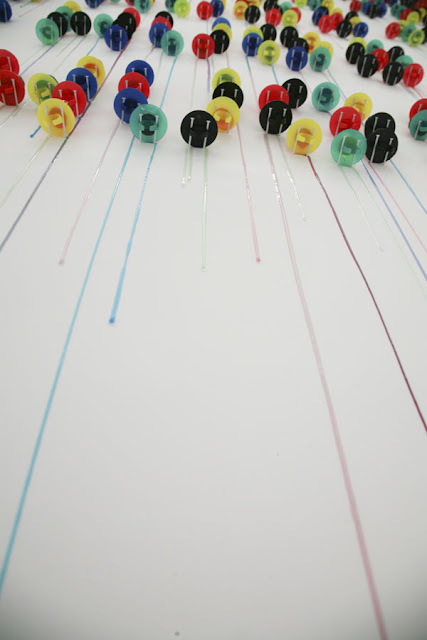 There is something about her work that may seem very simple yet so beautiful and wonderful to look at. I think this is really neat, especially how the candy is just left to melt, I thought for a second it was string holding the ring pops up. I would like to hear more about her stance on her art though.